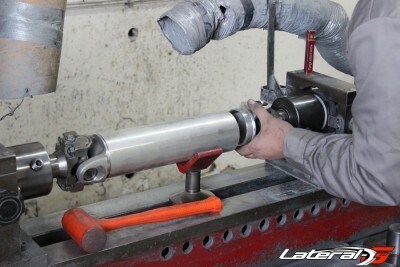 One of the most critical components on your ride is often one of the most overlooked – the driveshaft. This component is usually an afterthought for most – the last step in the process of upgrading or restoring a car. However if the driveshaft isn’t right, then the entire car can have catastrophic consequences. It’s the difference between a smooth ride or feeling like you’re going down a gravel road in a horse driven wagon. This magical component is your driveshaft. A simple item that connects the integral parts of your drivetrain together, yet is just as important as the crankshaft. 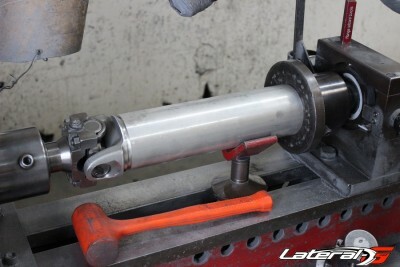 In it’s entirety, the driveshaft is a fairly simple component – a tube with a few U-Joints and that’s it. There’s more than meets the eye with a driveshaft though. In fact, there’s a lot of harmonics and geometry that can’t be seen with the naked eye. When building a car, the placement of the driveshaft should be taken into consideration as soon as possible to ensure a vibration-free drive. 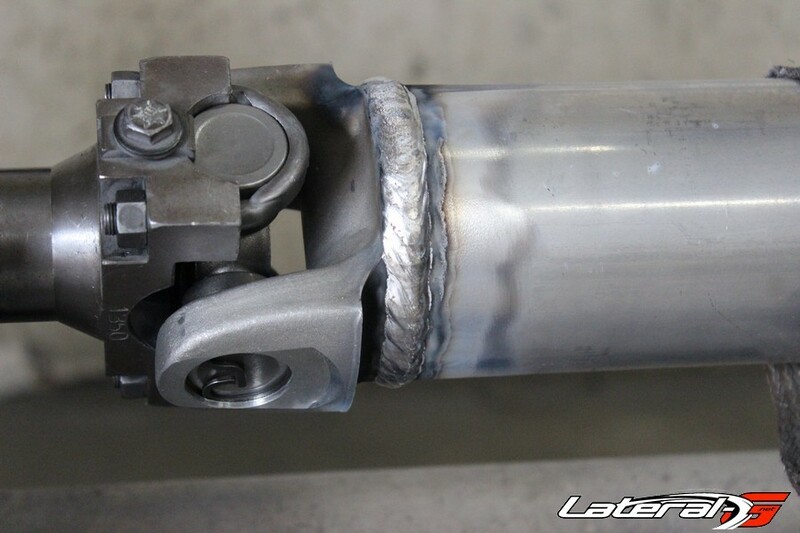 We wanted to know more about driveshafts and what it takes to get it right, the first time. With that in mind, we called up Inland Empire Driveline, an expert in the field of driveshafts and talked to Jeff Gilroy. “There’s a lot more to a driveshaft than people think,” said Gilroy. First and foremost, you need to make sure that you’re measuring correctly for the driveshaft. 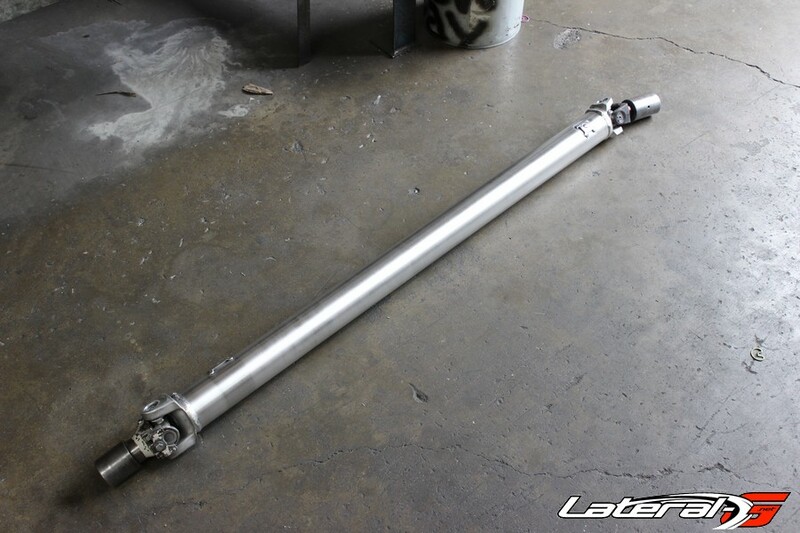 You don’t want a driveshaft that’s too long and bottoming out or too short and risking a fall out. Measuring for a driveshaft is fairly simple, and there’s a nice form to fill out right here. For Inland Empire Driveline, they want to know what the distance is from the tip of the output shaft on the transmission, not the housing, all the way to the face of the yoke on the rearend. Some people want to measure inside the cups on the yoke, or the case – if in doubt, refer to the order form. 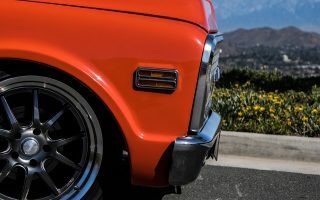 If you’d like even more information regarding the angles needed in order to achieve a smooth ride, refer to this pamphlet from Inland Empire Driveline. “One of the biggest factors with a driveshaft and it’s overall performance is tubing diameter, which is a result of critical speed,” stated Gilroy. The critical speed is the tubing diameter in a ratio of RPM. In other words, critical speed is the RPM of the driveshaft in which it fails and looks like a pretzel. The length of the driveshaft is a factor in this too – the longer the shaft, the sooner it will reach that critical speed. The solution for these is to use a bigger tube. 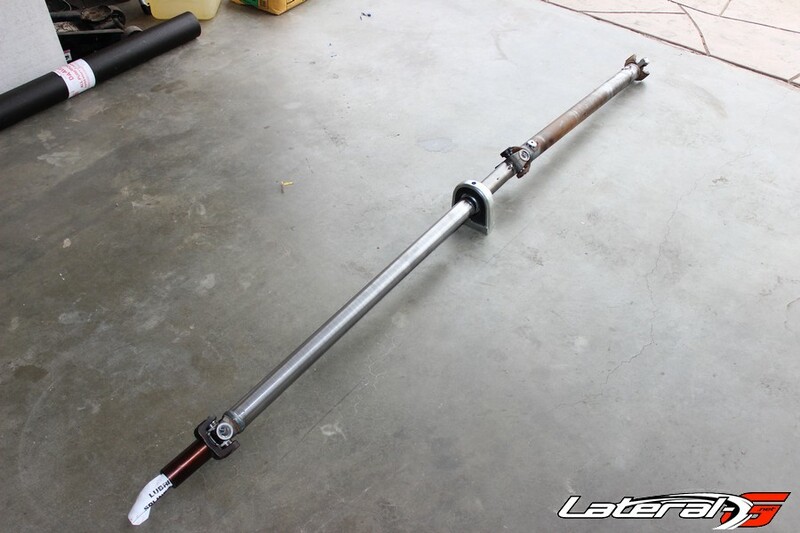 Instead of a 2.5″ or 3″ diameter driveshaft, you’ll probably have to step up to a 4″ driveshaft. This is also where you see aluminum and carbon fiber driveshafts come into play as well. Can’t you use a thicker wall material and keep the smaller diameter? “No. The problem is that since you’re using a thicker wall, the shaft becomes heavier. 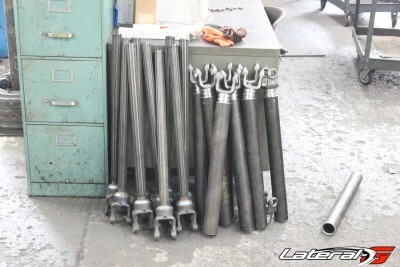 What might be a forty pound driveshaft becomes a four-hundred pound driveshaft during high RPM’s,” explained Gilroy. The Phasing of a driveshaft. 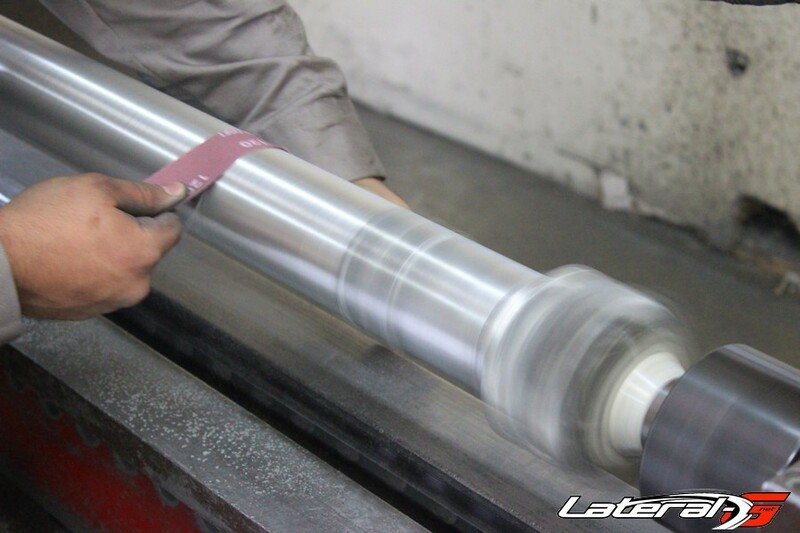 Another term or consideration in driveshafts is Phasing or In-Time. 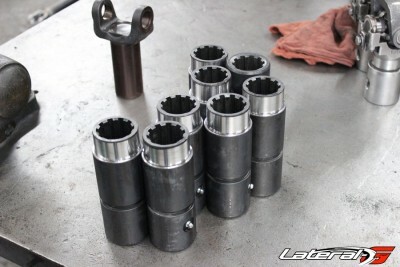 “This is when you’re building the driveshaft and you make sure that the U-Joint’s line up,” stated Gilroy. If the U-Joints aren’t lined up perfectly together, then you’ll see some vibration as well because they start working against each other. Phasing is a simple step that must be checked when you’re building or modifying the driveshaft. Whipping point is basically the same thing as Critical Speed. Imagine the driveshaft, especially the metal tubing in a perfectly straight line. The more RPM’s the shaft sees, the more likely it is to get out of shape, almost looking like a jump rope on a kids playground. When that happens and it reaches the Critical Speed, the shaft gets twisted up like a tin can and could get pulled out of the transmission, or come apart completely. What if your car already has a driveshaft, and it vibrates more that a margarita mixer? There’s a whole host of things that could cause the problem from the wrong angle, ill-fitting U-Joints, and everything inbetween. Luckily, Inland Empire Driveline has a handy guide that will help determine the problem with your driveshaft, and give you the solution to it as well. All you have to do is hop on over to their Trouble Shooting Guide. Avoiding vibrations or a catastrophic failure is fairly easy. Our suggestion is to give the guys at Inland Empire Driveline a call during your planning phases and talk to them about your intentions with the car. “If you tell us your car is a weekend cruiser, and we build you a driveshaft accordingly but we find out you’re winging it out on the dyno, adding power adders and everything else, then it might fail on you,” Gilroy told us. You have to be upfront with them what your intentions are with the car. The driveshaft is just like your brakes – sure the stock brakes are fine for cruising around. But when you start going to the track and pushing the car, you want to upgrade them. A driveshaft is no different in that aspect. Lastly, take some time and read a great article they have, called Power Train Set Up. This will go over all aspects of your power train, ensuring that the end result is a driveshaft that won’t fail or cause any sort of vibrations for you. With the tube cut, it’s then milled within thousandths of an inch. Once you have everything figured out, exactly how is a driveshaft made? 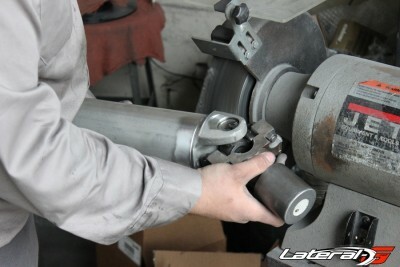 We were curious as well, so we swung by Inland Empire Driveshafts and looked over the shoulder of one of their experts. 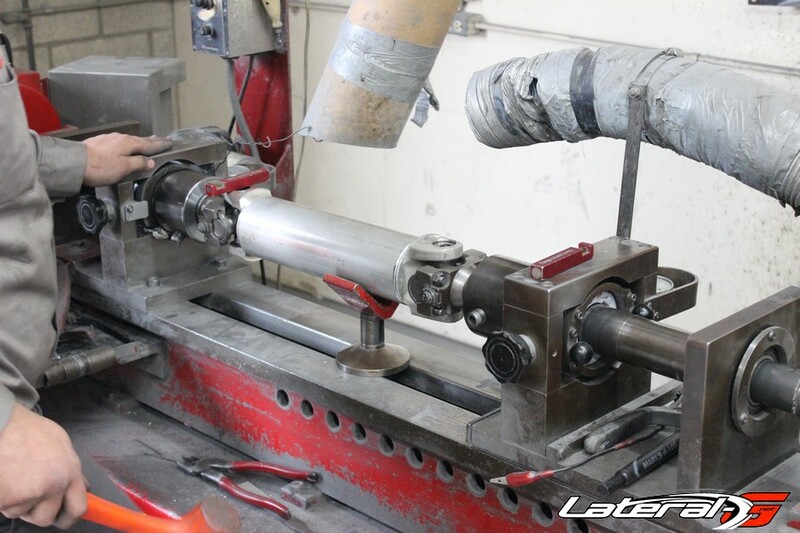 Making a precision driveshaft isn’t something you want to attempt in your garage, but with all the right tools they were able to knock one out in roughly a half hour. The first step was to cut the tubing to length, then mount the tubing into a mill that made sure the cut was perpendicular to the tube within thousands of an inch. From here they load the tubing and yokes into a jig. 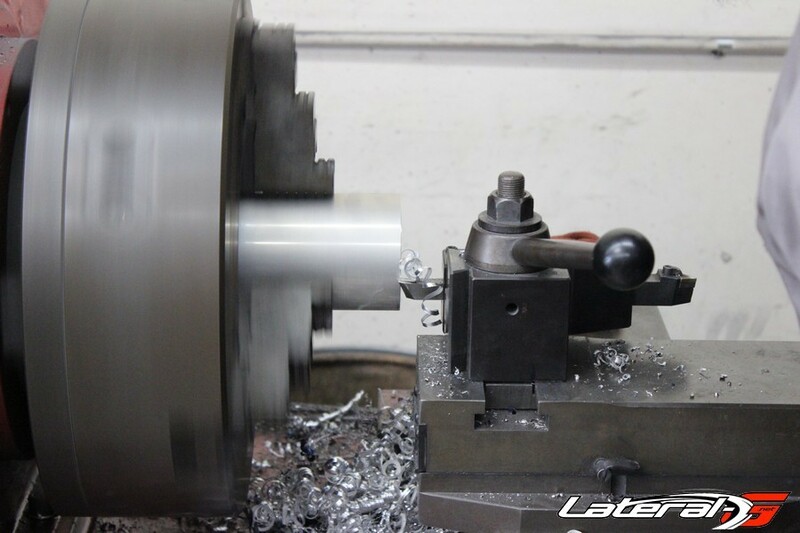 This jig starts by press fitting the yokes into the tubing, making sure they are properly phased. A dial indicator is also used to ensure that they are square and don’t have run-off. Then the yokes are welded to the tubing. In order to achieve a perfectly penetrated weld, the weld is autonomous. 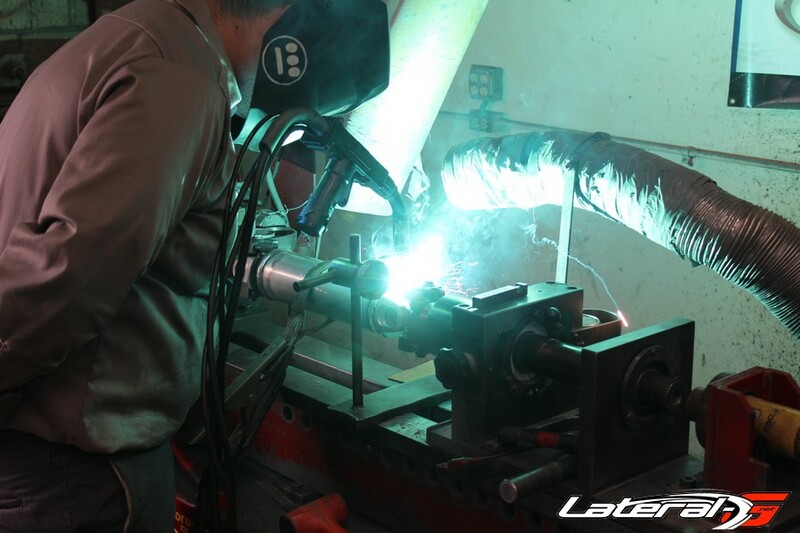 A motor slowly spins the driveshaft and a welder lays down the bead. The only part the operator is responsible for is turning on and off the welder. 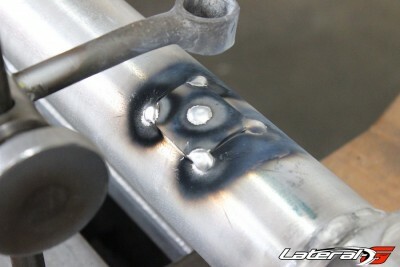 With everything welded, the next step is to make sure it’s perfectly balanced. This jig also spins the driveshaft, and using a strobe light type system shows the operator exactly where a weight needs to be added. This is then welded on, and re-balanced. The last step on the jig is to clean it up using sand paper and cloth, for a professional finish that’s ready for paint. 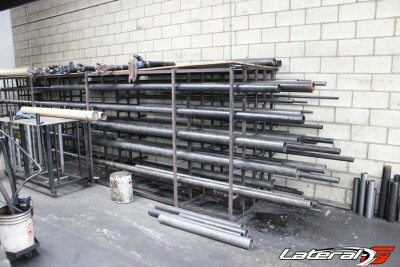 Need a two piece driveshaft? No problem there either! Thank you to Jeff Gilroy and his team for letting us watch over his team’s shoulder. When you are ready for a driveshaft, give Inland Empire Driveline a call at (800) 800-0109 or hop on their site at Inland Empire Driveline!